Bottle of Healy & Gray Frizzante 200ml - a wonderful Italian sparkling wine. With hints of apple and apricot, this is both a fresh and fruity wine with plenty of fizz and sparkle. Tempting Truffles - a big bag of 15 Milk, White & Dark sensational chocolate truffles. Smooth delicious chocolate wrapped around an irresistibly smooth melting filling. Bath Blaster 160g Azure Skies - so she can lie back in the bath and dream of sunny days and watching the clouds go by! With a wonderful refreshing scent, this fabulous bath blaster fizzes beautifully in a bath of warm water, releasing its perfume and essential oils and softening the water ready for a nice long soak. Ready and wrapped, it's packed in a funky red bag and topped with lime green tissue. 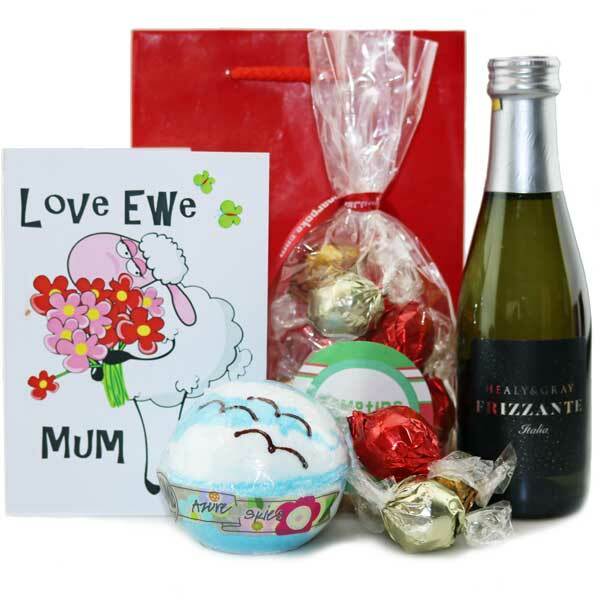 Perfect for your Mum, Mummy or Mother! Great little pack, nice to include a little bottle of wine too. Fast delivery.